You don’t have to be a horror aficionado to know that corpses are scary. The lifeless husk of a human being, the rapidly decaying meat suit that housed all our thoughts and memories, is a brutal reminder of our fleeting mortality. 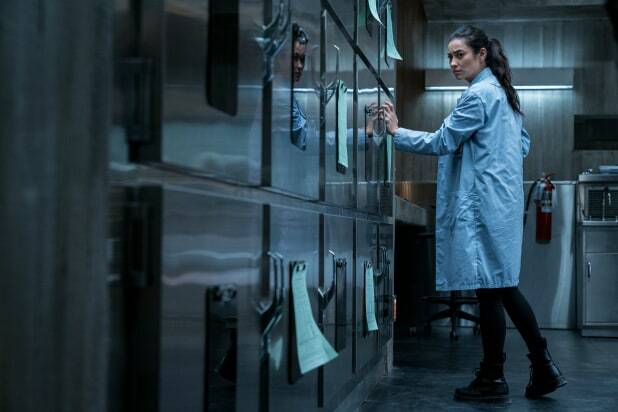 So it stands to reason that a film like “The Possession of Hannah Grace,” about a woman working in a morgue where one of the corpses refuses to stay still, would be pretty darned scary. If only in principle. And yes, that’s true. And only in principle. “The Possession of Hannah Grace” takes a concept so unsettling it’s already been turned into one great movie — “The Autopsy of Jane Doe” — and turns it into a dreary horror thriller, without any of those pesky thrills. “Hannah Grace” begins with an exorcism scene so mechanical that it plays like a last-minute reshoot. Drab tones, rigid shafts of sunlight streaming through the windows like an episode of “The X-Files,” and a young woman (Kirby Johnson, “5150”) getting mumbled over by priests. Who she is, besides someone named Hannah Grace, is never discussed. She is just a girl with a demon inside her, and the movie only cares about her as a plot point. Three months later, Megan Reed (Shay Mitchell, “Pretty Little Liars”) gets herself a new job as an overnight intake assistant at a hospital, working all alone during the graveyard shift, in a building designed like a nuclear bunker, with automatic lights that have the quirky tendency to turn themselves on in the shape of a crucifix. It’s a creepy place but a boring gig, and apparently Boston isn’t a very deadly town, so over her first few nights Megan has only a couple of bodies to deal with. One of them is the corpse of Hannah Grace, who has picked up a whole bunch of gruesome wounds since last we saw her. And wouldn’t you know it? The door to her refrigerated drawer has a tendency to open all by itself. If that idea scares the bejeezus out of you, get used to it, because that’s all “Hannah Grace” has for a while. Half the movie ticks by with humdrum repetition, as Megan does her job, wanders hallways, and contemplates her history of substance abuse and one of those tragic pasts that can be summed up in a 45-second flashback scene. It’s a miracle anytime someone shows up for her to talk to, even though they rarely have anything to contribute to the film other than a bit of dialogue. Of course, many horror movies have extended scenes of people just wandering through dark hallways waiting for something eerie to happen. A lot of them get away with it, too, because they’re engaging in a time-honored storytelling pastime called “showmanship.” The pacing is modulated to keep the audience ill at ease; the music lulls you into a false sense of security before the string section suddenly goes nuts. It’s the difference between a story told in monotone and the same story told with inflection, and it makes all the difference in the world. “The Possession of Hannah Grace” is a story told without much storytelling. The idea isn’t terrible, the setting is fundamentally creepy, and many of the jump scares would actually be jump-scary if they had a little “oomph” on them. But our protagonist isn’t developed enough to carry a whole film by herself, with hardly anyone to talk to, and the movie plays like composer John Frizzell (“Leatherface”) wasn’t really feeling it either. Frizzell’s score disappears for huge chunks of this movie, and when it does finally kick in it sounds muffled, as though it’s coming through the wall of your apartment via your neighbor’s subwoofers. Wherever that music is, it’s probably pretty effective, but it’s doing nothing for us here in our theater. Even a lot of the jump scares fly by without any accompaniment, not because they’re scarier that way (they’re not), but for — well, reasons that cannot be fathomed, actually. The story of “Hannah Grace” continues apace and builds up a body count, as the corpse of Hannah Grace emerges, murders all of Megan’s co-workers, and then slinks back to its drawer so Megan has no idea what’s going on. Meanwhile, Hannah’s father keeps trying to break in and burn the body, but of course that’s crazy, and it couldn’t possibly be important later. It’s a remarkably perfunctory film, punctuated by some bone-cracking contortionism (presumably left over from “The Last Exorcism” and “The Devil Inside”) and mediocre acts of violence. “The Possession of Hannah Grace” takes that novel premise from the infinitely scarier “The Autopsy of Jane Doe” and strips away everything but the corpse and the locale. It lacks character, it lacks morbidity, it lacks subtext, it lacks suspense. It just kinda lays there like Hannah, but without any of her sinister magic.